In 1975, the fabulous Charlie Rich, country singer and former Sun Records labelmate to Johnny Cash, Elvis Presley, and Jerry Lee Lewis, walked onstage at the Country Music Awards, visibly intoxicated, and instead of handing an Entertainer Of The Year award to John Denver (which was what he was there to do in the first place), took out his lighter, and burned the envelope. Whether out of envy of John Denver (who was having a successful run in the early seventies, while Rich himself was languishing despite his immense talent), or as an affront to the country music industry for rewarding the not-very-authentically country Denver, the point was made. Indeed, Denver was more of a folky—Peter, Paul, and Mary covered his "Leaving On A Jet Plane", after all, and despite "Thank God I'm A Country Boy" and "Take Me Home, Country Roads", Denver's output will always have a seat in the corny 70s pop department. I've always liked John Denver, if only for the sentimental memories of hearing his music daily on AM radio when I was a kid in Idaho in the 70s and 80s. 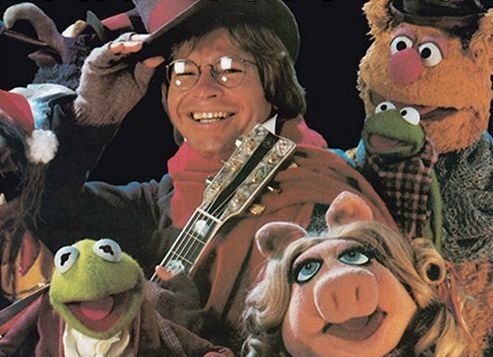 But if his regular Muppet Show appearances put him in a league with Paul Williams (with whom he shares both AM radio songwriting and a regular Muppet Show gig), few can deny that the man could write a song. Exhibit A: In 1972, Ray Charles—no stranger to covering country songs, or any other genre, for that matter, slipped an amazing cover of "Take Me Home, Country Roads" on his 1972 album A Message From The People, taking Denver's gentle, folksy original and turning into a joyously funky country hoedown. As good as Ray Charles' version is, this next version might even be better. Toots & The Maytals, one of the greatest reggae groups ever, may have been John Denver fans, and have recorded several other unexpected covers (you should hear their "Louie, Louie"). This track, originally from their 1974 LP "In The Dark", takes Ray Charles' version (likely the version they heard first) and somehow makes it even more sentimental and exhuberant, substituting "West Jamaica" for "West Virginia". Enjoy! I love toots and ray because they recognized that john denver was a wonderful songwriter - Also, I've always been a sucker for low's cover of 'back home again'.